- Excellent engineers, sales and after sales service team brings the best service to ensure long-term satisfaction for our customers. Egg carton making machine is becoming popular among users today. It is because the machine can help you achieve the environmental friendly objective. 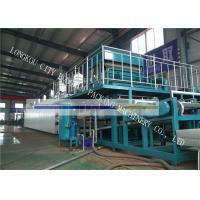 Both small and big companies are currently making use of paper egg carton making machine. It means that the machine is trendy and can withstand the test of times. With the help of the raw materials of water and waste paper, it will be possible to make use of the machine. The production process of the machine includes pulping, mold forming and drying. The machine also have another name – egg tray machinery. Change the mould, you can make egg tray, egg carton, fruit tray, bottle tray and so on. This machine is controlled highly automation, easily learned, convenient services, and can widely use in different business. It can produce egg carton, egg box, egg tray, bottle tray, agricultural train seeding cup, industrial production packing. The equipment is best-selling nation and is sold abroad. Put the waste paper to pulper to make pulp, after some support equipments and 3 pulp pools, the pulp concentration will become 0.8%-1%. Forming machine and the support equipments make the pulp become the egg tray. Different pulp made by bulrush, straw, bagasse, bamboo, wood etc. Such as paper board, carton, newspaper, waste pulp in paper making factory. Fibre of palm, straw, sugarcane etc. There are 2 kinds of drying system. One is Metal drying, the other is the kiln drying. The conveyor plate can be one layer and multi-layer, direct combustion hot air circulation. Using the imported or joint venture brand burner (domestic uses the stove bar), equipped with an automatic control cabinet. Our pulp molding machinery factory is a large enterprise which specializes in producing of various kinds of paper pulp molding products and equipments. With the professional engineers and skillful staffs, we have researched and developed many kinds of paper egg tray machines. The innovation of every time can make the paper egg tray plant more perfect and more efficiency. The egg tray making machine price of our company is more reasonable and more competitive at the market of recycling waster paper egg tray machine. Because we set the price according to the cost of egg tray machine. The productivity of our quail egg tray making machine is different from 1000 to 7000pieces output per hour. When you need to produce a large amount of egg tray from waste paper, you can choose the used paper egg tray making machine which has the mould quantity of 48units. You also can choose the small egg tray machine because of the small productivity. We would like to design and adjust the egg tray machines for sale to meet your special requirements. 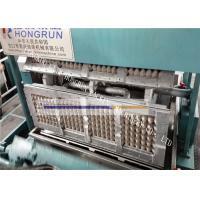 Meanwhile, we provide perfect after-sales service for the egg tray making machine for sale. Our egg tray machine buyer comes from all over the world. Our mini egg tray machine also has a good reputation worldwide. The reasonable price of egg tray machine is waiting for you. If you need paper eggs tray machine, just contact us! We will answer you as soon as possible. Our pulp molding machinery factory is a large enterprise which has established for many years. The enterprise is a company integrating research and development, manufacture, sales and services. 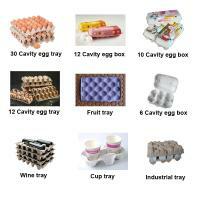 It has the mature skill and abundant experience in producing making machine egg tray carton. The equipments of our company enjoy a good reputation all over the world and are sold to many countries, such as Algeria, Egypt, Russia, Ukraine, Australia, Argentina, Brazil, Saudi Arabia, Libya, Syria etc. Contact us ! Don’t miss the chance of promoting the production efficiency of your company. 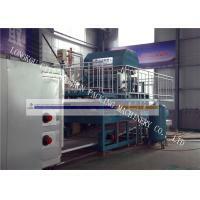 Our box egg tray making machine can produce egg tray from 1000 to 7500 pieces output per hour. We have different models for egg carton machine, such as the molds of 12 units, 16 unites, 32 unites, 40 unites, 48 unites. You can choose the appropriate equipment according to your productivity. The dryers include drying in the sun (below 1000pieces), semi-automatic dryer, automatic dryer and the metal dryer. To achieve the environmental friendly goal, many enterprises have began to use paper egg carton. So egg carton machine complies with the trend of times. 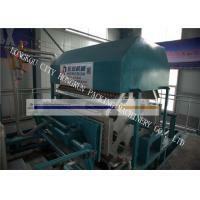 The egg carton making machine uses the raw material of waste paper and water to produce paper egg carton. The egg carton manufacturing process is raw materials pulping – ingredients – mold forming – drying –packing. The additive is pigment which you can use to produce all colors of egg cartons. Another kind of additive is glue which has the anti-water function. When you use the additives, you should add the appropriate amount. The paper egg carton making machine can not only produce egg carton but also produce apple carton, shoe carton, strawberry carton, etc. except the main equipment that referred above, there are some other equipment necessary for a total line, customers can choose to buy it themselves or from our side.such as the stock pump, high pressure water pump,water-ring pump,air compressor,fliter,air storage tank, refrigerated air dryer and so on.there small equipment comparised to main equipment and can be easily found somewhere. Using recycled paper as the raw materials which reduces the pressure to environment and plant. As we all know, the paper is made from wood. It is an eco-friendly way to use the waste paper as the raw material to make egg trays. The raw material of the egg trays is waste paper. We fully take the advantage of the waste paper. We turn them to the way of earning money. If you just have a lot of waste paper, the project of paper tray making machine is worthy of investing. Either you’re going to take action and seize the new opportunity or someone else will. Don’t hesitant. The semi automatic egg tray machine of our factory adopts the anticorrosive material. And, the every part of the machine has been tested to make sure their quality and the normal operation of the machine. So, our machine can service you for a long time. 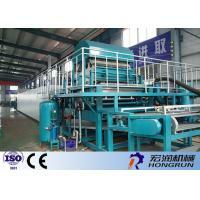 The semi automatic paper egg tray making machine can make the waste paper turn into money. The egg trays are made of waste paper, such as newspapers, waste cartons, magazines. Our machine is just to make egg trays, fruit trays. This type of the machine can produce 2000 pcs, 3000pcs, 4000 pcs, 5000 pcs one hour. Commonly, the semi automatic paper egg tray machine consists of three system: pulping system, forming system and drying system. Compared with the fully automatic egg tray making machine, the semi machine doesn’t have automatic egg tray drying line. 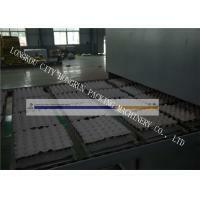 The worker should convey the wet semi-finished products to drying area with a cart. So, the machine needs more labors. Certainly, the cost of semi automatic egg tray making machine is lower than automatic type machine. From these, we know that the semi machine is fit for medium and big scale factory. The recycled paper like newsprint or corrugated carton will be used into the pulper. The machine will beat and smash recycled paper to a certain pulp consistency. Then, pulp from pulper will directly go the pulp adjusting tank. Then the pulp is adjusted to ready pulp consistency. There will be forming tools in forming system, which contains transfer tools and wire mesh. Wet products can be formed by using vacuum system. The formed wet products can be transferred to the transfer tools by using compressed air effect. 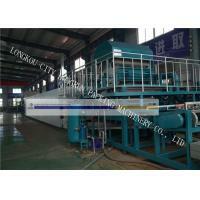 Dryer of fully automatic paper egg tray machine has two types, single layer dryer and multi-layer dryer. The dryer is brick and metal egg tray drying line. Wet products should go through dryer tunnel. On the other hand, the dried products should be counted and stacked at the end of the dryer. You can select fuel as per your convenience. It can be diesel, or natural gas. The automatic machine also has another name- rotary egg tray making machine. Because it is a machine of rotary running. We are the best one of the egg tray making machine suppliers. We can customize the egg tray machine according to your demand. With our machine, you will earn a lot of money. Don’t hesitate to contact us, we will answer you as soon as possible. Paper egg tray is often considered a sustainable packaging material. It is produced from recycled materials, and can be recycled again after its useful life-cycle. With the wide application of paper egg trays, the paper egg tray making machine is becoming the hot sales machine on the markets. The automatic egg tray machine has fully automatic production process. The unique characteristic of the automatic machine is that it has automatic egg tray dryer. With this kind of machine, you can dry the semi-finished wet egg trays automatically. Pulp molding products are a kind of new packing material. This is a new buzz in recent years. Pulp molding is the process of using raw material pulping ingredients and mold forming drying packing. Pulp molding machinery is a type of environmentally friendly equipment that mixes waste paper and water as raw material. The pulp moulding machine cost is low and you don’t need to speed too much money. 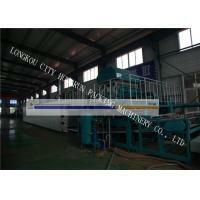 The pulp molding machines have great develop prospect on the market. The major equipment of the machine are three parts include: Pulp Making System, Molding System, Drying system and packing system. Hydraulic, Pulp Pump, Pulp Screen Machine, Pulp Breaking Machine, Stirrer and so on. Rotary Type Molding Machine, Vacuum Pump, Air Compressor, Vacuum Tank, Water Pump and so on..
High quality of pulp molding machine for paper trays could design according to the customer’ requirement. For pulp molded 30-cell egg trays : first the worker will weight the raw material and put them into the conveyor. 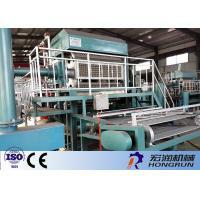 Then the pulping ,forming, drying and stacking will be finished automatically. After drying, the finished products will be packed by workers. A hot pressing section should be added in the production of pulp molded egg box/carton(6-cell,10-cell,12-cell,6+6-cell,15-cell),fruit tray and cup carrier after drying because of shrinking. The egg box/carton can be labelled or printed after hot pressing. These processes could be finsihed manually or automatically. 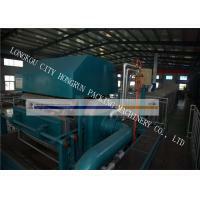 Longkou City Hongrun Packaging Machinery Co., Ltd. is located in the beautiful shandong peninsula city-Longkou, beautiful environment, and transportation is very convenient. Our company relies on many years of technical strength, continued development that accumulates valuable experience. At present, we already have independent research and development, production and after-sales service, such as one-stop business model. Longkou City Hongrun Packaging Machinery Co., Ltd. adheres to quality as the fundamental, market-oriented, and serve as public praise of management aim that continuously to provide high quality products and services to domestic and foreign customers, mainly to provide customers with various types of EPS foam machine, PS foam food container production line, pulp molding machine, EPE foam machine and other plastic packaging machinery, which are used in production of fruit, vegetable and aquatic product packaging, industrial, food, medical, handicraft industry product packaging, and building and insulation, can satisfy the more customers various needs. Depending on high products quality and excellent after-sales service, our company enjoys great reputation among our customers. Products have been exported to all over the world, and won high praise among the domestic and foreign customers. 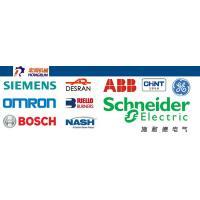 Our excellent after-sales service could always guarantee regular technical support to our customers. Our company adheres to the customer's demand as own duty, constantly to proceed product research and development and technological innovation, actively forge ahead in the plastic packaging machinery industry, constantly improve, to ensure that the product is the industry leader. Longkou City Hongrun Packaging Machinery Co., Ltd will take the enterprise conception of high quality, honesty, and factualist and innovate, sincerely welcome the friends from all over the world to visit us!